Supernatural Underground: Fury of the Phoenix release giveaway! : "mea culpa! i totally forgot about my actual posting day on the eighth because: 1. it was spring break with my bubs and i was trying to kee..." Go to one of my fav blogs to enter this awesome contest! 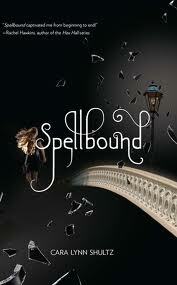 Head over to this link for an amazing YA ARC Giveaway! I honestly haven't counted them all (there's too many!) but I'm so excited cause, if you're like me, then you LOVE receiving free books- It's like Christmas morning times a thousand haha. I can't wait read them all and review them right here on my blog. As well, some of them will be put in the pot at my epic giveaway contest- If you haven't entered scroll down so you can enter LOTS OF BOOKS UP FOR GRABS! That's what I received this week- can't wait to start reading them all. What did you get? I'd love to hear from you. Congratulations Mendy! I'll be sure to email you so I can get all your info and send Maze Runner right out to you. I would just like to say that I'm so excited to be giving away copies of My Soul to Take and Firelight- These are two of my absolute favourite series and I recommend them to anyone! Here's this round's question- answer in the comments- Tell me what your favourite YA paranormal series is and why it's your favourite? You MUST be a follower and leave a comment in order to enter this contest. Here's what you can do to earn extra points. Winner(s) will be chosen at random. This round is open until Thursday, May 5th, 2011 midnight- Winner will be announced on my blog Friday, May 6th after 12pm. This contest is only open to US and Canada residents sorry. Good Luck everyone and Happy Easter! *Special Note: I just wanted to thank my followers for the wonderful comments left on my last review post. Your comments truly meant a lot to me and made my day. I hope you will continue to enjoy them. Thanks Again YOU GUYS ROCK!!!!! I was lucky enough to receive an advance copy of Roth's debut, and from the moment I flipped to page 1, I was hooked! Roth has created a dystopian society that is reminiscent of the atmosphere depicted in Margaret Atwood's A Handmaid's Tale- and combines it with the action and romance found in Collins' Hunger Games trilogy. Roth is an exceptional writer and has the ability to capture a character's raw emotions that the reader can empathize with. There are no two dimensional characters in Roth's well constructed plot. Everyone has depths that reader isn't allowed to fully reach. Beatrice/Tris is an amazing heroine and narrator that will appeal to both female and male readers. She's tough and relentless but has her vulnerabilities (she's not indestructible and doesn't win every battle). Divergent is a dystopian novel, so of course the mood of the story is dark and violent (there are very few chapters that don't contain some measurement of violence,) and it's this dark violence that keeps the pacing and action of the book in check. Four is a great male lead to Tris, but be aware the romance in this book is very muted- Roth focuses on character development and action in her debut novel. That being said, the hopeless romantic in me would love to see more development on the relationship between these two characters. Muted romance aside, Roth has crafted a wonderful and imaginative atmosphere in her debut novel and I will definitely be keeping my eye out for her next installment! Ok so I can't help but notice that I have WAY too many copies of a certain few books on my shelves. So I thought to myself Hayley why not give them away to your faithful followers haha. Ok guys so here's how this is gonna work, right now I have 21 books to give away and I will give at least one away each round. How long are the rounds you ask- well they are two weeks and each round I will give you a fun question to answer (nothing hard or strenuous I promise). So the first round begins tonight Friday, April 8th (not the 13th as stated in a previous post- I need to get an agenda right haha) and will go until Thursday April 21st midnight, where I will draw a winner (or maybe two, you won't know until I've drawn them) The first winner(s) will be announced on my blog on Friday, April 22nd after 12pm, as well, that is when round two will begin and so on until I run out of books. McCoy is protecting these books for me while I'm at work during the day and trust me he's vicious. As I said earlier this round is open until Thursday, April 21st midnight. This contest is open to Canada and U.S. residents only sorry. It looks like I'm not the only one giving out an insane number of books, check Kody Keplinger's (author of The Duff) blog for contest details. It's open internationally!!!!! Willow knows she's different from other girls, and not just because she loves tinkering with cars. Willow has a gift. She can look into the future and know people's dreams and hopes, their sorrows and regrets, just by touching them. She has no idea where this power comes from. But the assassin, Alex, does. Gorgeous, mysterious Alex knows more about Willow than Willow herself does. He knows that her powers link to dark and dangerous forces, and that he's one of the few humans left who can fight them. When Alex finds himself falling in love with his sworn enemy, he discovers that nothing is as it seems, least of all good and evil. In the first book in an action-packed romantic trilogy, L. A. Weatherly sends readers on a thrill ride of a road trip - and depicts the human race at the brink of a future as catastrophic as it is deceptively beautiful. 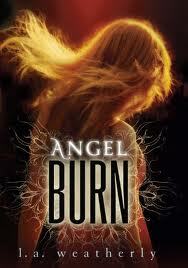 To be honest I had my reservations when I first started reading this book for the simple fact that it is told from multiple perspectives (I like books told in first person and from the girl's perspective) however, I was up way past a healthy hour, reading Angel Burn. The action in this book is tremendous and the interaction between the two main characters, Willow and Alex, keeps the pacing of the story alive. 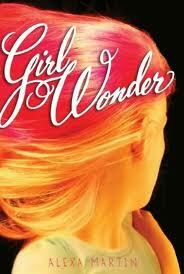 I couldn't help thinking of Twilight while reading this book. Now don't get me wrong, there's nothing similar in the two stories- plot wise- however the love story between Alex and Willow really gives Bella and Edward a run for their money in the sense that they're chemistry is electrifying. Plus Willow is a very strong and brave character- her relationship with Alex doesn't define her but rather, compliments her character. Weatherly writes a very touching and fragile relationship between Willow and her mother (whom's is infected with Angel Burn) , and I must admit I did have a tear or two in my eyes while reading one scene between these two. Move over Edward- cause Alex is here to stay. Alex *swoon* is a great character with his own turmoil from his past. He's strong and knows how to handle himself and will do ANYTHING to protect Willow. Weatherly has spun her own unique and successful take on the Angel epidemic plaguing the YA genre (I mean halos as the heart of the angel, come on how brilliant is that?!) As I write this review I can't decide whether to categorize this book as an action novel with a love story on the side or a love story mixed with action- Weatherly has interwoven these two so masterfully that there's no way to distinguish the two from each other. So thank you Weatherly for keeping me up until all hours of the morning with your gripping story. I only have one thing left to say- MORE PLEASE!! The second book in the Angel Trilogy, Angel Fire, is set to hit shelves Fall 2011. This is what I received last week- it was a pretty big week for me. What books did you get? First off I want to thank all who participated in my very FIRST CONTEST! Thank you all for your great comments, I really enjoyed interviewing Kelley, and just in case some of you were wondering, I did interview her in person and she is AMAZING! You guys rock! Secondly I apologize for my lack of posts this week, it was an insane week but I promise to post more reviews and author interviews this week. Thirdly, I'm sorry for posting this message so late but I was at a Kelley Armstrong signing today and got myself a copy of the Gathering YAY! Congrats, please email me a hayleyagillis AT yahoo DOT ca with your mailing info, so I can get you your awesome pack ASAP. If I don't hear back from Taking It One Book At a Time, by next Friday, April 13th-I will redraw a new name from the pot. Sorry guys McCoy's not up for grabs! Be sure to check back again next Friday for details on how to enter this Freakin Sweet contest!